Click on the map to go to that area of the website. 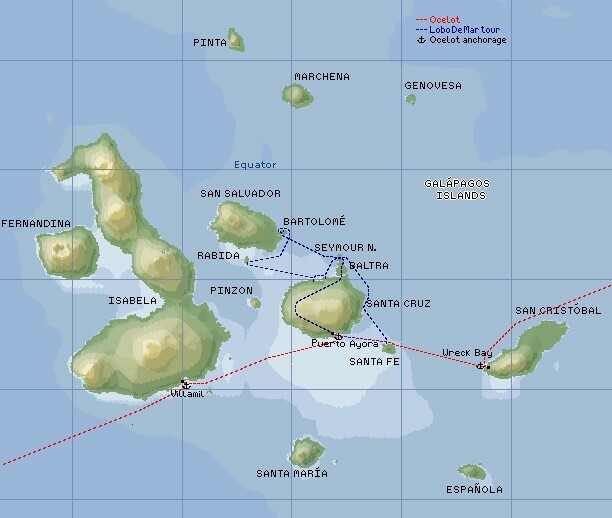 Here is an overview of the main group of the Galápagos Islands. There are several more islands up to the north, but they are tiny and we didn't get there. There are only four places that private yachts can anchor in the Galápagos without paying a lot of money - either by fines for illegal entry or by hiring a guide on your own boat. Three are marked on this map by little anchors, because those locations are where we spent most of the twenty days that we were allowed. Wreck Bay, by Moreno (the Galápagos capital) on San Cristóbal, is where we landed after our passage, and where we spent our first few days. Puerto Ayora, on Santa Cruz Island, is a far larger town and the hub for most of the tour boats. The anchorage, Academy Bay, is exposed to the south and a bit rolly. There are lots of boats in there, more than half being tour boats, but there are lots of places you can go to see cool things or do more interesting activities. Villamil, on Isabela, is probably the most protected anchorage. It has a tiny village, but also nice birds, walks and snorkeling easily accessible from the boat. The only place we could have gone with Ocelot but didn't was the bay one over from Post Office Bay on the north side of Santa María (also known as Floreana). We also went on a four-day tour on a local boat. We started from Santa Cruz, and went to several other islands in the area: Rábida, Bartolomé, Santiago, South Plaza, and Santa Fe. Although it was still expensive, it was much cheaper than getting a guide for Ocelot. Geological: The Galapagos island chain, like the Hawaiian chain and several other archipelagos in the world, formed as an oceanic tectonic plate moved over a stationary 'hotspot' or hotter than normal area of upwelling magma in the earth's mantle. This hotspot melted through the plate, forming an underwater volcano. As the plate slowly moved, the volcano became higher and higher, starting from the ocean floor. It is uncertain whether the first volcanoes broke the surface before they moved off the hotspot and another volcano had to be formed, but today, there are several extinct underwater volcanoes that the plate carried east, away from the hotspot. Even so, it was about 4 to 10 million years ago that the easternmost and oldest of today's Galapagos Islands formed, and they had certainly been building underwater for a long time. Those volcanoes are now extinct, and erosion is slowly reducing them. However, several islands on the western end of the chain, most notably Isabela and Fernandina (both of which probably formed in the last million years) are still volcanically active. The hotspot is still active, and the plate is still moving. There are notable eruptions in the Galapagos several times a decade, and new underwater volcanoes are probably already pushing towards the surface. Eventually, they will become the new active islands in the chain, as the slow but constant movement of the tectonic plate carries the completed islands east, and away from the heat and pressure of the hotspot. Ecological: After the Galapagos islands formed, they were bleak, lifeless landscapes of lava flows. There was no fresh water and no vegetation. The distance (about 600 miles) that separates the islands from mainland South America meant few species would even arrive on the Galapagos. For those that did, there was no food, no water, and no soil. However, the Galapagos islands are in the path of the cold and nutrient-rich Humboldt current which comes up from Antarctica and South America. This current accounts for the arrival of underwater life to the islands, which provided the first food source for migrating birds and marine mammals. While migratory birds may have visited the islands, there was still no land vegetation. Without soil, the first land colonizers of the Galapagos were probably lichens and similar plants, capable of living on the lava and slowly converting it to soil other plants could use. The seeds, pollen, or spores of lichen, fungi, and the early colonizing plants of the Galapagos could have been transported to the islands by the trade winds, which blow in the general direction of the islands all year, or by birds which had eaten the seeds or gotten them attached to their feathers or feet. Even then, there would have been little life on the islands. Many plants need special pollinators, and the odds of plant and pollinator arriving together were far worse than the plants' already remote chances. Some did arrive, but there are still few pollinators on the Galapagos today. Nonetheless, enough plants successfully adapted to start a land ecology. Birds, now having a local food source, could stay longer, and were very important in transporting plants to all of the islands. So, how did the land animals arrive, and why such an odd selection of them? The most likely answer is the large rafts of vegetation that float out to sea when South American rainforest rivers flood. These rafts, which are usually small and often sink, have occasionally been sighted up to about 1000 miles offshore, and covering several hundred square feet with many animals and plants on them. However, though the Humboldt current would carry the rafts in the right direction, animals being transported would be at the mercy of the tropical sun and ocean for about two weeks. Amphibians and most mammals cannot survive in such conditions, but reptiles need little water and are not hurt by sun exposure. This explains the predominance of reptiles on the Galapagos islands. Upon arrival, there would still be the matter of colonizing the island. Male and female pairs would need to arrive within their reproductive lifetimes, and would have to find food and an ecological niche where other colonists would not compete with them. This competition for resources led to adaptations such as the marine iguanas feeding underwater and the various Darwin finches having beaks adapted to different plants. Also, the land animals could not (for the most part) move between islands. Thus, the giant tortoises on each island have unique shell patterns, and land iguanas are only found in some areas. The characteristics of the islands largely determined which creatures would settle where; large islands have more room, tall islands have a greater selection of climates, and older islands have more developed ecosystems. For more on the human plundering of the Galapagos, see the essay in Sue's Log.